US Marshal Teddy Daniels and his partner Chuck are sent the Shutter Island, off the coast of Boston, where the Hospital for the Criminally insane were housed and treated. Teddy and Chuck were trying to find the escaped murderess, Rachel. While there they also wanted to find out what kind of practices were really taking place on the island. Teddy had his own reasons for being there. The man who murdered his wife was there. A hurricane blows in and the men are trapped on Shutter Island, which provides much of the action. I was not all that impressed with the story until the last two cds of seven. I thought it was slow and weird. But then the last part of the book just blew me away and made up for all the rest. That’s really all I can say about it. To say more would ruin it for you. This book is in production and slated for an October 2009 release date. Martin Scorsese directs and Leonardo DiCapprio plays Teddy. Mark Ruffalo, Ben Kingsley, Emily Mortimer, and Michelle Williams round out the cast. I always think the book is best, but this could be a better movie than book, especially with such a compelling cast. Dr. Matt Thorne recuperates from his injuries at his sister’s quaint inn in small town Minnesota. While there a local Amish woman cares for him and sparks fly between Matt and Sarah. She is a widow, not well educated, but loves to read and learn. Matt is a big town doctor who charms women into his bed without much effort. What will happen when they fall in love and Sarah has to choose between her family and Matt? I found this romance tedious and very predictable. It was full of the cliches that riddle bad romances – she walks in on him naked, he walks in on her naked, she needs to shave him because he is too weak to do so… The book is only 246 pages and it did not really get interesting until the 200 mark. She could have done so much more with the Amish aspect, but it came too late in the book. I have read almost all of Hoag’s mysteries and enjoyed them all, but the two romances I’ve read have not been good. 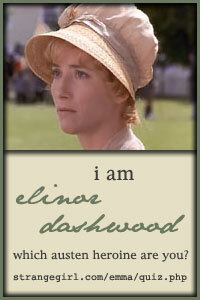 So, even if you like her mysteries I caution you to not waste your time on the romances she wrote early in her career. She’s gotten so much better since then. Does anyone have a favorite? I’m not much of a Halloween girl, but this made me laugh. A few years ago I put together a 5000 piece puzzle and I swore I’d never do it again. Not only does it take too long, but at some point it stops being fun. 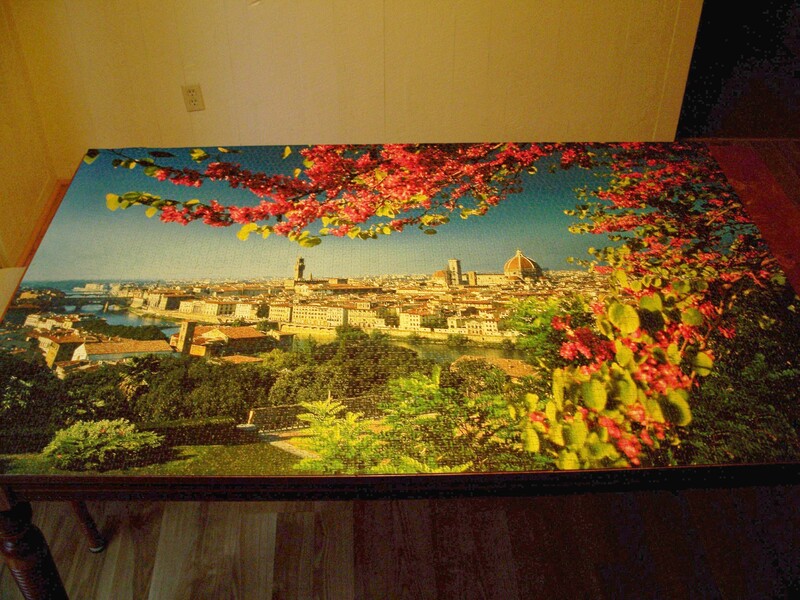 But, in February I was looking on ebay (a wonderful place to get puzzles) and saw this beautiful puzzle of Florence, Italy. We were finalizing or trip to Italy, so I bought it. And started piecing it together in February. And did not put the last piece in place until last night. October 24. Obviously I took time off here and there, but still… I’m never doing another 5000 piece puzzle again. Really. A special thanks to those of you who came by the house and took the time to put in a piece or two. It may have taken me another month to finish without you! 5000 piece puzzles are expensive and I’m willing to give this puzzle away, but I won’t pay for shipping. Once I put it back in the box I’ll weigh it so you have an idea how much it may cost to mail. If you are interested, let me know. EDIT-I’ve mailed this on to South Africa. I saw this quote today and couldn’t help but pass it along. I’m also including a quote from the insightful Douglas Adams which I also find fitting during this election season. It is important to vote and I hope you have all voted or will be voting on November 4 – even if your vote isn’t the same as mine. It’s so easy to get discouraged by all the lies being told this late in the campaign, but I’m hoping we voters can prove that we care about the truth and we care enough to vote. Professor Randy Pausch was a man who had it all – a dream job, wonderful wife, three healthy children. What the 47 year old did not have was a lot of time. He was diagnosed with pancreatic cancer and given a short time to live. This book is a companion to the Last Lecture he gave at Carnegie Mellon University in August 2007. I’m not sure what I expected, but it was not the upbeat and entertaining read that the book proved to be. His ability to deal with his prognosis in such a constructive and inspirational way was profoundly touching. This book was written for his children and it is full of advice and wisdom, but also filled with stories that will make you smile, like Randy and Jai’s hot air balloon ride on their wedding day. I liked so many things about this book. His argument for handwritten notes, his take on dented cars, and his belief in being a true mentor for his students are a few things that come to mind. He also mentioned Ohio State in passing and that always gets points with me. I would recommend this book to anyone without hesitation. It only takes a short time to read, but it will leave you feeling better about life. The website, http://thelastlecture.com/index.htm, has access to extra information and you can watch the hour long Last Lecture from there as well. Randy died in July, but his great spirit will live on not only through his words, but also through the thousands of people he touched during his lifetime. True crime author Bailey Weggins is back in her fourth mystery in the Big Apple. Bailey switches from one magazine job to another and is fast embroiled in a murder mystery. Her nasty boss is murdered and there is no shortage of suspects and lies. Bailey must work her way through the maze of red herrings and attempts on her life to find the truth and get the scoop for her story. Bailey is a tough thirty-something divorcee living in Manhattan with a fun and feisty personality. She’s like a big city Nancy Drew. I’ve listened to two of this series on cd and really liked them, but this one was missing something for me. It was still good, but Bailey felt a little tired. I had no idea who did it until the very end, which was good, but the end didn’t really wow me after the multitude of possibilities. I would still love to hang out with Bailey and will read her other books. Author, Kate White, is the editor of Cosmopolitan magazine. It shouldn’t come as a shock for those of you who regularly read my blog that Jason and I met in a bookstore. 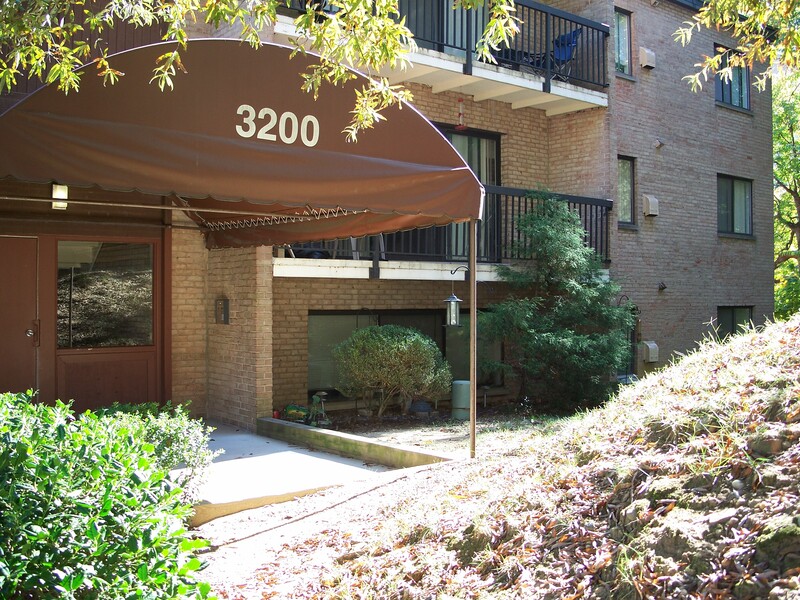 I was an assistant manager at the B Dalton at Ballston in Arlington, Virginia, and his buddy in the Navy worked there part-time. We met, had a few dates, and I knew I had found someone very special. We took a trip to Italy earlier this year that we called our 10 year anniversary trip, but decided we would mark the day with a trip down memory lane. 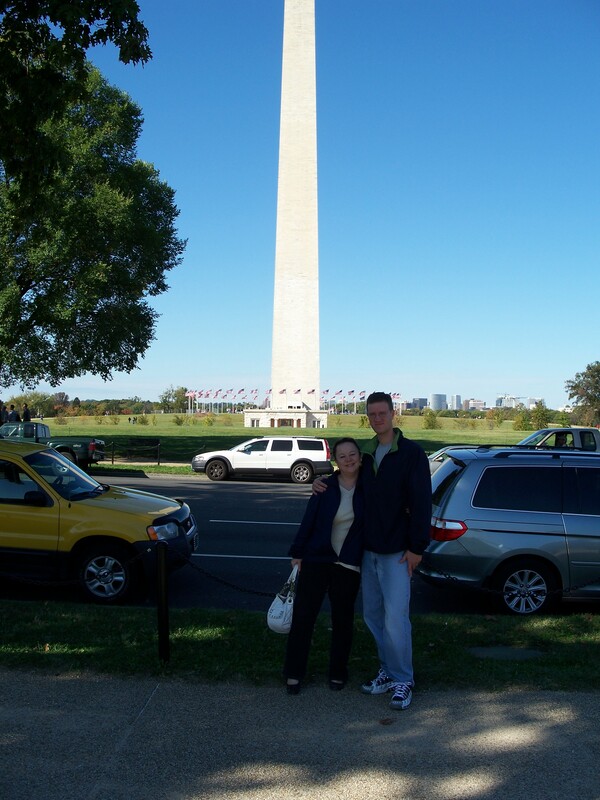 It’s been a little over 10 years since we lived in the DC area and when we left the house we didn’t even take a map. Our first stop was the bookstore where we met. I did become store manager eventually and I was disappointed to see that the place has really let itself go! We drove by where my first apartment should have been, but it has been razed to make room for condos. We found our first place together and marvelled at how far we’d come on 10 years! We found a sports bar to watch the Ohio State – Michigan State football game, which was a tricky thing on an anniversary weekend. You all know I’m a Buckeye. but Jason is a Spartan and we are both trash talkers during the game. So, the best thing I can say about the game is that we made it through, love intact. I love the Metro system. I love visiting places that have good public transportation. 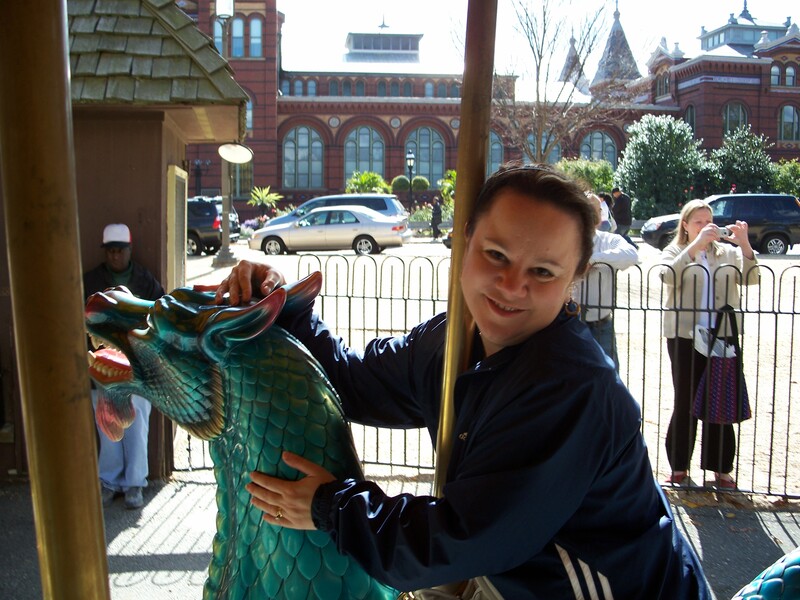 We took the metro to the Mall and visited a few Smithsonians, the WWII memorial, Vietnam Memorial, Lincoln Memorial, and rode the Carousel like two kids 🙂 We basically acted like goofy tourists and had a fantastic time. 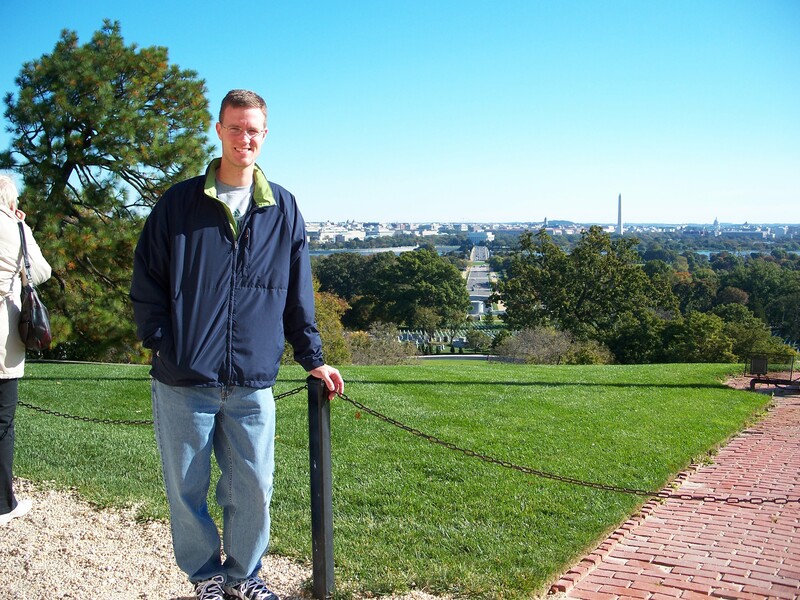 We visited a favorite place for both of us, the Arlington Cemetery and saw the Changing of the Guard, Lee’s House, and spent some time getting lost in the history and the sacrifice that have made this country great. 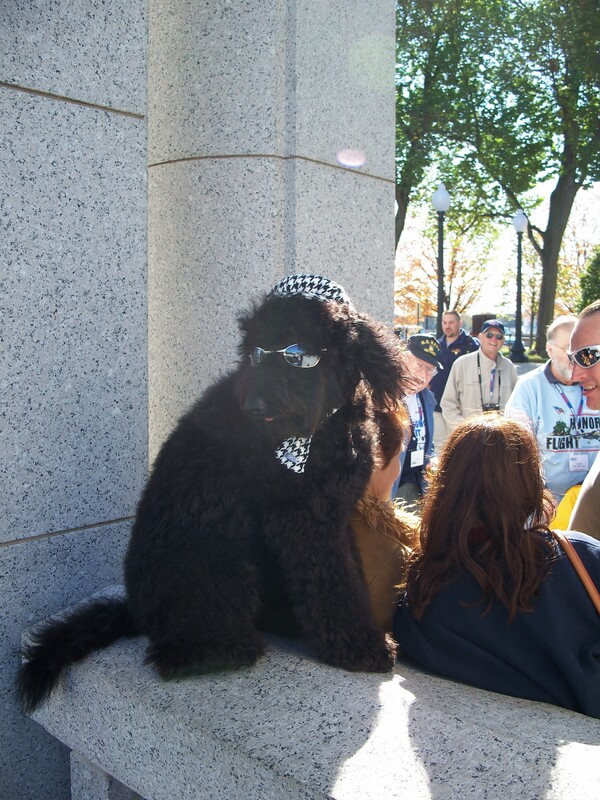 I have to add this photo of the cool dog that we saw at the WWII Memorial. He was posing for pictures for anyone who wanted to take them. How cute is he? !